At least 2 million people in the United States become infected with bacteria or fungi that are resistant to antimicrobial drugs each year, according to the Centers for Disease Control and Prevention (CDC). 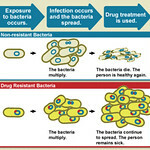 Over time, microbes have evolved and adapted to the drugs designed to kill them, making some infections increasingly difficult to treat. NIAID is combatting this growing public health threat through biomedical research to develop new and better ways to prevent, diagnose and treat antimicrobial-resistant infections. Check out NIAID’s Flickr site for downloadable, high-resolution antimicrobial-resistant microbe images and related graphics.